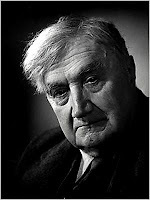 Today is the 140th birthday of English composer Ralph Vaughan Williams. His home town of Down Ampney (in the Cotswolds) is planning a memorial concert of some of his works this evening. CWS at Conjubilant also reminds us that Vaughan Williams edited The English Hymnal (1906) and links to his setting of "God be with you till we meet again" from that hymnbook. Vaughan Williams provided settings for many hymns [his choral works are listed here]. A very good CD collection of his hymn settings is A Vaughan Williams Hymnal .